In 1998, I had a rare opportunity to see Noel Gallagher play an intimate solo gig. 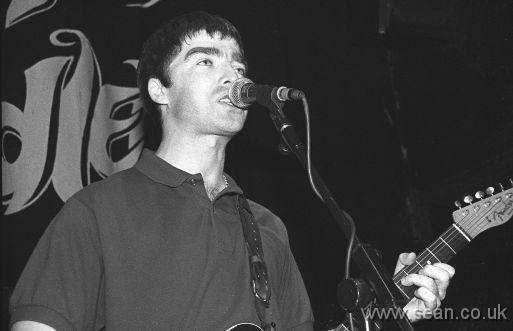 It was a couple of years after the Oasis Knebworth show (which I also saw), but the band was still playing huge venues, and it was unusual to see chief songwriter Noel in a small venue, and without his brother Liam beside him. The concert was a benefit gig in aid of the striking Liverpool dockers, and it took place at the Mean Fiddler in London. Tom Hingley's band The Lovers was also on the bill. 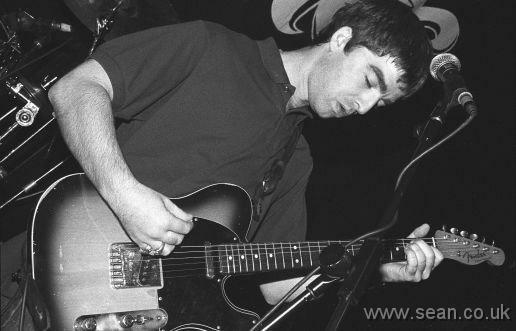 Noel played a selection of Oasis hits, unaccompanied by other musicians. It was fantastic to hear him singing the songs he'd written, bringing new nuances to many of them. Today, of course, Noel and Liam have split Oasis up and Noel has a solo project called Noel Gallagher's High Flying Birds. These photos are scanned from the original black and white negatives.